Well, when I came back from travelling abroad I found that 'NRC Handelsblad' had indeed devoted ample room to the Furaha project. 'NRC', as it is known, is a Dutch quality national newspaper. The weekend edition has a 12 page science supplement, and this weekend's supplement had three pages on Furaha: the cover and the spread in the middle. I am afraid I cannot direct you to the relevant pages on the internet to have a look for yourselves, as these are open only to paying customers. Those with subscriptions can download a good quality pdf file. I have a subscription and have the download, but will not publish it here. After all, the newspaper is supposed to make money. Then again, at some point in the future I may yet do so after conferring with the newspaper people. For similar reasons the images below will give you an idea what the article looks like but not in enough detail to read it. 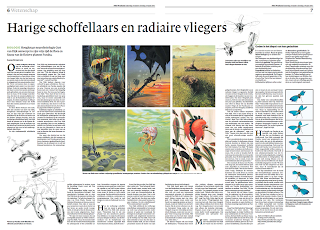 Most of you would be unable to read it anyway, it being in Dutch, my native language. 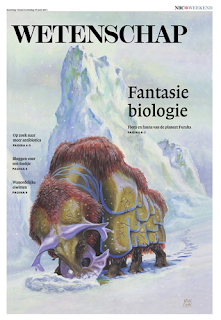 It is a very nice article, written by Lucas Brouwers, who also writes a blog -in English- on evolutionary biology. Here is the cover. I took it from the digital edition, meaning the contrast is much better than in the printed edition, and the colours are also closer to those of the original. 'Wetenschap' means 'science'. (The two words may not overlap entirely. The English version of Wikipedia has a nice entry of the meaning of the word science: "Over the course of the 19th century, the word "science" became increasingly associated with the disciplined study of the natural world including physics, chemistry, geology and biology. This sometimes left the study of human thought and society in a linguistic limbo". In Dutch 'wetenschap' seems to used in the latter broad sense more often than in the narrow one). And this is the inner spread. Regular readers will recognise most images. Two have not been published on the site though, eroding my store of fresh images a bit more. Mind you, the text does not go into what they are or why they look the way they do, so some mystery remains. 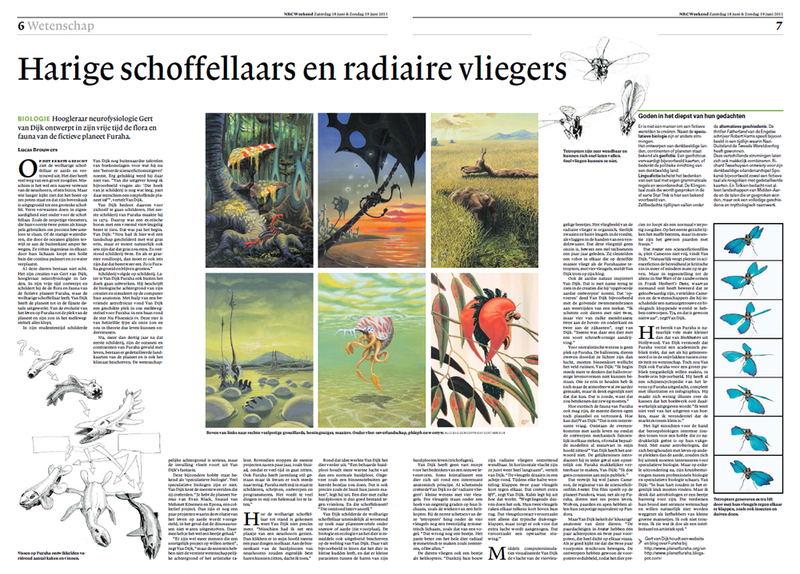 You might wonder why a science section of a serious newspaper devoted three pages to a speculative biology project, and that was what I asked the journalist before the interview. He answered that neither he nor his colleagues had any trouble with a mixture of solid science with creative and less factual matters. I am glad of that. Science is too often treated by scientists and others as if it is so serious that you should speak only about it with a straight face and in hushed tones. Well, without creativity science would not only simply not work but would be nothing more than drudgery. I hold similar views about the speculative side of matters, where I prefer to see a mixture as well: fantasy is not the same as idiocy. The best of science fiction is characterised by a 'sense of wonder' as well as a 'what if?' attitude. You cannot do science without them. Congrats! I'm with you-- there is no reason science can't be fun, & thought experiments are great. Very impressive! It's building some general internet buzz around world building as well, I had "nrc handelsblad furaha" show up in my search engine hits yesterday. Congratulations on the exposure! I'm tempted to get a temporary subscription to NRC Handelsblad just so I can get a copy of the .pdf file. "Science is too often treated by scientists and others as if it is so serious that you should speak only about it with a straight face and in hushed tones." I've met far too many people that treat "science" and "skepticism" as synonyms. It's my assertion that the biggest innovations in scientific theory have come about because people were willing to consider possibilities outside the conceptual hegemony. Skepticism certainly plays a role in the scientific method, as all experimental results must be rigorously tested for an objective outcome, but it shouldn't stifle the excitement and wonder of scientific work. I too am glad that Brouwer and his colleagues recognize that fact. "I do not think there are other animals, extant or extinct, whose name expresses a quality of their pelt." "The best of science fiction is characterised by a 'sense of wonder' as well as a 'what if?' attitude. You cannot do science without them." Four of the pictures may be familiar, yes; but we only know what two of the six are of. Great blog. For years, i´ve looking for a blog like this... Congratulations. Another way of access is by Role Playng Games Books. I would like to suggest one for you. Try "Alien Compendium - Creatures of the Verge" from Star Drive System. There´s a interesting part about "Ecologycal" Data (Biochemistry, Enviroment, Biome...) It´s only few pages about "Ecodata", but there are another great creatures too. If you want, I can scan some pages and send for you after... Give me some email. YES, this is fantastic news! Congratulations! The new pictures are a great treat, especially the one elaborating on fish evolution. The piece with the avian is beautiful and intriguing; Is the creature a member of the flyg family, or something else? It resembles an Aggie, if I remember correctly.